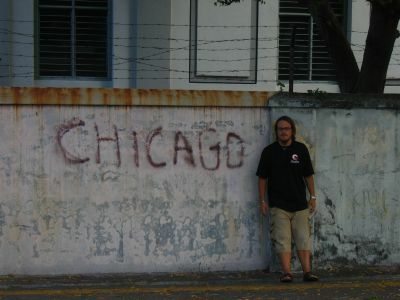 my malaysian friend hood liang ee lives on the island of penang, in the city of georgetown, in malaysia. zac and i headed out of thailand to visit him and stay at his home. we walked around georgetown one day while he was working and i snapped this picture of a mosque. 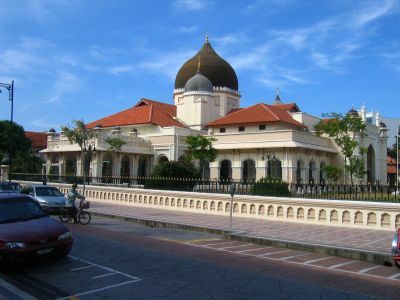 malaysia is an islamic country so there are many mosques around. some graffiti i encountered in georgetown. made me a little homesick. at least made me miss the best pizza in the world: chicago style deep dish pizza. for god's sake, someone bring me one frozen in dry ice from pizzeria due!! 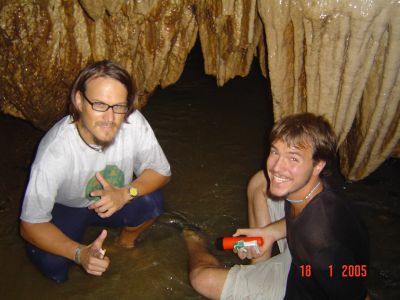 my friend hood liang took zac and i cave-exploring in malaysia. we crawled through an underground river, literally with our heads just above the water as the stalagtites pressed down. best cave experience i've ever had. here zac and i are sitting in the muddy river water. the monster hood liang emerges from the depths of the river to slaughter the masses. 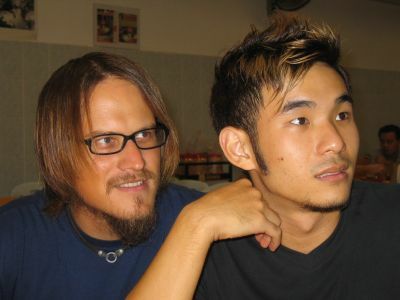 i help hood liang order at a chinese restaurant in kuala lumpur, malaysia. well, my cantonese is not so good so maybe i was just distracting him. 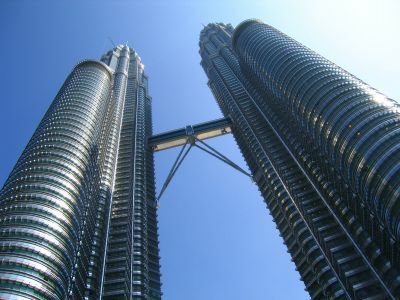 the petronas towers of kuala lumpur rise into the clear sky. these things supposedly dethroned the sears tower in chicago as the tallest building in the world but under much controversy - i'm glad taipei 101 in taipei, taiwan has eclipsed them both so i can stop being so angry about it all. 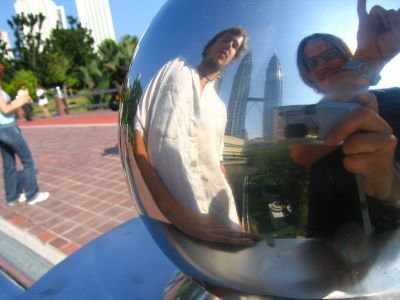 zac and i pose in front of a reflecting globe of the bridge near the petronas towers. i tried to accomplish something here with this shot; not sure i succeeded. 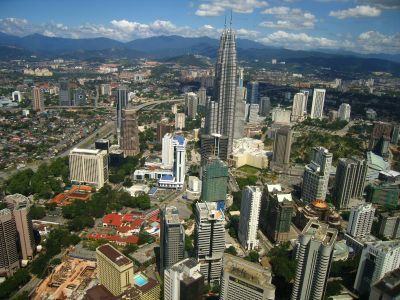 the kuala lumpur tower is much higher than the petronas towers and offered great views of KL. 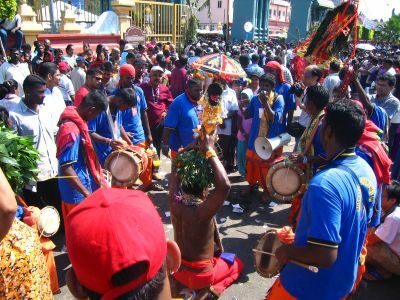 the hindu festival of thai pusam took place while i was in kuala lumpur. 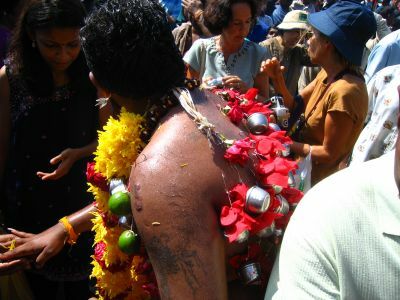 people dress up in wild outfits, stick hooks and swords into their backs and faces, and gyrate to thumping drums as they climb up the stairs into the batu caves above the city. quite a spectacle. after i took 8000 pictures of him, this guy got a bit fed up and gave me a hindu death-stare. i limped for a week. those are hooks in this guy's back. she has a spike through her cheeks and tongue, and one in her forehead. she was bobbing and jumping as she walked toward the stairs into the cave, apparently in a pious trance.